hen there is a serious incident at work, emotions take over and the steps that need to be taken after an incident has occurred are forgotten. Ensuring that all supervisors and managers are equipped with a Supervisor’s Notebook is an effective way of ensuring that the proper procedures are followed in the wake of an accident. Proper documentation is also a key factor in proving due diligence. 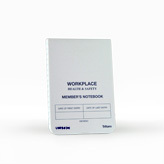 Supervisor’s Notebooks are designed to be part of an effective and methodical plan to deal with accidents and incidents, should one occur in your place of work. The policies and procedures described are in accordance with the Ontario Occupational Health And Safety Act. OSG Inc. is committed to ensuring that your workplace remains safe and healthy, and that a workplace accident never happens. However, in the event that an injury or illness occurs at work, be prepared and be ready to prove due diligence by having all supervisors and managers carry a Supervisor’s Notebook.